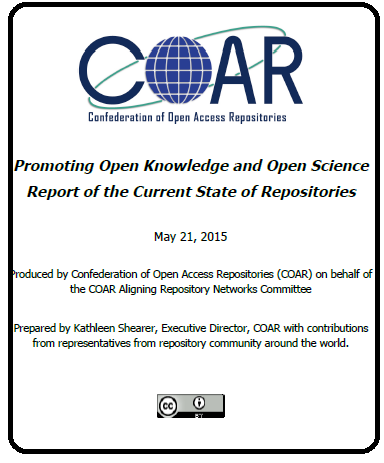 The Confederation of Open Access Repositories (COAR),on behalf of the COAR Aligning Repository Networks Committee recently published a report entitled ''Promoting Open Knowledge and Open Science". This report presented an overview of the international repository landscape and was written with a broader audience in mind. Institutional repositories are one of the key routes to Open Access. A typical repository contains a wider range of materials that reflects the intellectual wealth of an institutions' output - these outputs includes published journal articles, articles (pre-prints) accepted for publication (post prints) conference papers, book chapters, books, working papers, doctoral theses , datasets (and etc) results from research projects. Over the last 2 decades, open access repositories have been implemented around the world and are now well represented in all regions. The Directory of Open Access Repositories (OpenDOAR) is a directory of academic open access repositories and currently has over 2,600 listings. Another repository directory is the Registry of Open Access Repositories which lists more than 2,500 institutional and cross-institutional repositories. In the past 5 years, repositories are becoming connected through thematic, national and regional networks - COAR did an interesting study of this development in 2014 ; one of the examples cited in that study was the OpenAIRE project. The present report states " with a growing number of funding agencies adopting open access and open science policies that rely on repository infrastructure for adherence, it is critical that the repository and funder communities forge closer ties and find mechanisms to engage in regular dialogue". Open access repositories play a variety of roles in the scholarly communication system, and these roles continue to expand and evolve. To date, their primary functions have been to provide visibility and open access to research outputs, with a focus on the journal literature, as well as to ensure archiving of this material over the long term. Many funders have adopted policies encouraging deposits of articles in repositories and repositories are key infrastructure to support these policies. Data from OpenDOAR was analysed and tallied per continent - Europe (44.4%), Asia (19.8%), North America (19.7%), South America (8.7%) and the remainder shared between Africa, Austraiasia, Caribbean and Central America. The majority (85%) of the repositories are institutional repositories hosted and managed by research institutions or universities. The report provides a brief outlook of regional status in Africa, China, Europe, Japan, Latin America, North America. Finally the report looks at challenges and opportunities that still subsist within the open repository terrain. These include alignment and interoperability; balancing global and local requirements; sustainability; value added services and visibility. There is however a hope for a global network of repositories that will act as the foundation for access, certification, quality assessment and further re-use of research outputs.